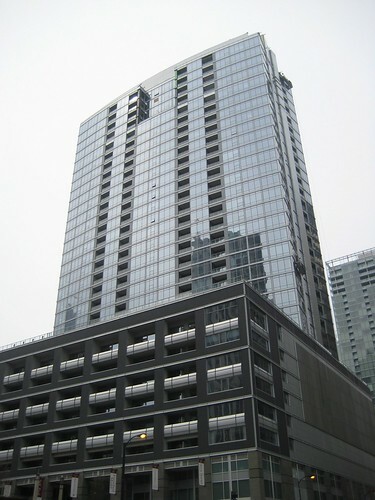 The Fairbanks at Cityfront Center in Chicago was built on top of an existing parking garage. In order to support the new football-shaped tower on the center of the garage, a 6-foot deep concrete transfer mat was used to distribute load to the stronger perimeter columns. If a tectonic shift sent giant crystals thrusting up through the water’s surface, it might look something like this dramatic arts center prototype by AS+GG. 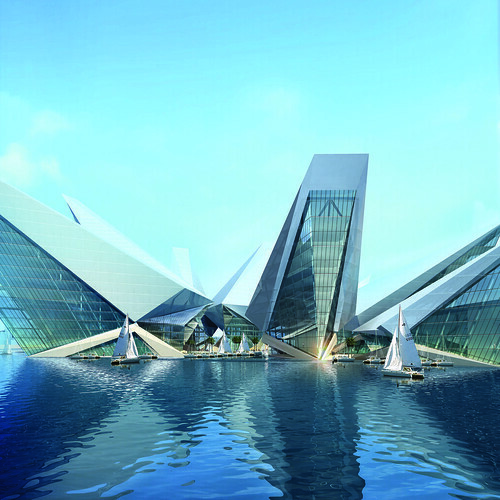 Crystal structures with cantilevers of up to 230 feet are joined at a base beneath the water. The Matrix Gateway Complex by AS+GG would be an exception to the rule of monotony in rectilinear buildings. It would provide residents a full 3-D city experience, featuring suspended platforms linking modular housing and community venues. Walter Towers are Danish architects Bjarke Ingels Group’s latest project in Prague, Czech Republic. Cool design, but will it stand? Will an unreinf. conc. dome stand? Few 1800-year-olds look so good. From within the rotunda of the Pantheon, you could be excused for thinking that the church was constructed just recently. Among all the remaining Roman sites of the Mediterranean, the basilica is probably the most well preserved. Two features contributed greatly to the preservation: its constant use as a place of worship and the incredible concrete enclosure that protects the interior from the elements. Constructed in 126 A.D., the Pantheon very likely represents the height of Roman structural engineering achievement. In fact, the 142 ft. diameter cupola is still the largest unreinforced concrete dome in the world. That record is in no jeopardy of being broken, as no modern building code would permit such a structure without the use of at least a minimum of steel reinforcing. 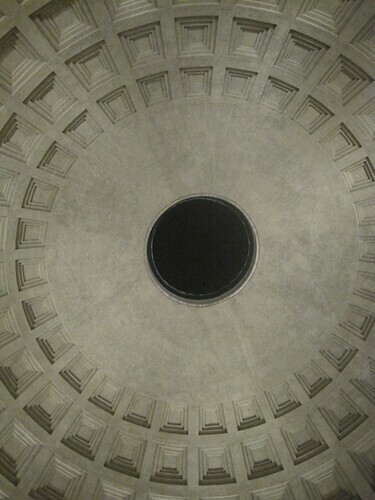 And yet the Pantheon stands today without any significant reinforcing to alter the original engineers' design intent. Ancient engineers and architects found a synergy in form that provides a visual experience while enabling the structure to function. Weight was judiciously removed from the roof structure by including a 30 ft. diameter oculus and coffered interior surface. The oculus is simply a large hole in the ceiling that admits the only natural light into the space. Some might also interpret the opening as a spiritual window to the world of the gods. The coffered sides of the dome provide a waffle-shaped pattern that draws attention upward. These two elements give the only outwardly apparent visual clues to the means of structural support. Several recent investigations have been undertaken to answer the mystery of the structure. The most frequent citation found on online accounts of the Pantheon follows: Mark, R.; Hutchinson, P. (1986), "On the structure of the Pantheon", Art Bulletin 68: 24–34. A nice online summary of those findings is presented by David Moore, P.E. at RomanConcrete.com. Some of the grandstanding is a bit unwarranted, but it is definitely easy to get carries away when describing the achievement of the Roman Engineers. To start with, the original designers were accustomed to super-sized structures. And for all the delicacy portrayed within the Pantheon interior, the first rule of the construction is to build it big. The strip foundation on which the curved building rests is about 34 ft. wide. The wall which supports the dome is about 20 ft. thick. However, perhaps to reduce weight or provide behind the scenes storage space, 8 large niches were created within the otherwise solid wall. As usual, arches are used to great effect to relieve distribute load to piers, thus permitting the openings. This great mass of wall was necessary to provide adequate resistance to the inevitable outward thrust of the dome. No buttresses or perpendicular supporting structures were employed, as was common in later medieval structures. The dome itself is nearly 20 ft. thick at its base and tapers to just 5 ft. thick at the oculus. A number of techniques were used to achieve the full span. First, a series of seven concentric rings of decreasing size were constructed one on top of the other, like stacking incrementally smaller metal washers. Other authors have suggested that this form is likely borrowed from the very early structural development of the corbeled arch - where a series of stones are stacked, with each cantilevering slightly past the previous. Using this technique, it's possible that the first stages of the dome were constructed without shoring down to the floor. Beyond the stepped region, the shell becomes a smooth continuous surface. 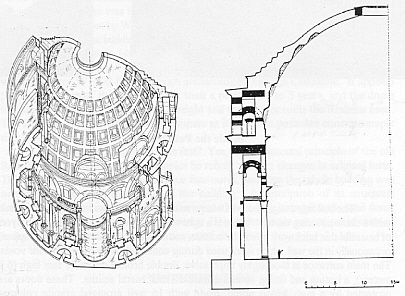 This part of the dome, in addition to the visible interior coffers, was likely cast on formwork supported from below. At the ring of the oculus, the building materials change again. Here a combination of tile and metal plates provide the compression ring that resolves all of the forces acting at the apex of the dome. The Roman engineers impressively used the materials and methods available to them for maximum structural efficiency. 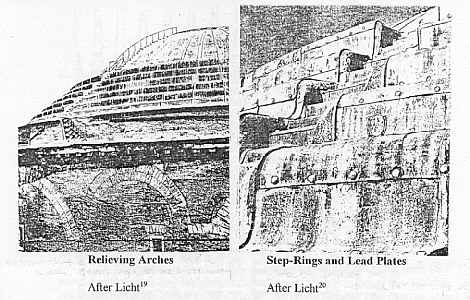 They even created special light-weight concrete to reduce the overall weight of the dome. The 85 lb/ft3 (PCF) mix used at the top of the dome is approximately 40% lighter than today's normal weight concrete. It's even lighter than most conventionally available lightweight concrete. Despite the selection of lightweight aggregates, the engineers still achieved a compressive strength near 3000 lb/in2 (PSI), very near modern expectations for standard strength concrete. It's also important to point out that the Pozzolan binder used by the Romans differs quite a bit from the Portland Cement we use today (which requires a very high energy industrial process). Despite their best efforts, cracks have been witnessed in the dome. The papers I reference above go into detail about their possible origins. They tend to equate the problem as one of excessive tensile hoop stresses near the base of the dome. Like a simple arch, domes also convert vertical forces into horizontal pressure. I prefer to think of the cracking in terms of the small displacement probably occurring at the top of the supporting wall. Stone and concrete, we all know is not a flexible material. The obvious solution to the problem would be to wrap the base of the dome with some form of tension ring, essentially preventing it from spreading further. However, experts again disagree about when the cracks first appeared. It's possible that they formed immediately after construction, and the dome has stood for over 18 centuries since. It's even possible that the ancient designers were aware of this phenomenon but anticipated it and compensated in the early construction phases. 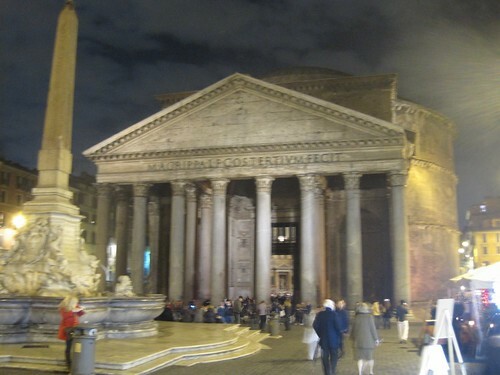 Barring a catastrophic seismic event, raging fire or destructive conflict, the Roman Pantheon seems to be in shape to survive many more centuries. It is a credit to the initial work of the designers to plan such a robust and awe inspiring building that future generations would have such keen interest in maintenance and preservation. The structural elegance of the rotunda will be an inspiration to engineers for many generations to come. 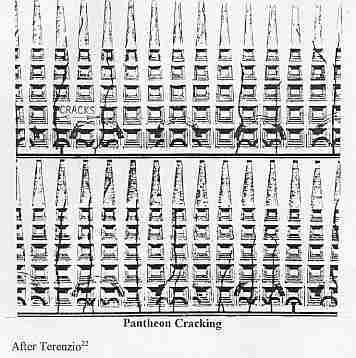 Do you think that the Pantheon should be reinforced to withstand possible seismic events, or should the original design integrity be maintained? Are modern building codes overly prescriptive, effectively stifiling innovation like that used at the Pantheon? Should naturally occurring Pozzolan binders used more often in modern building construction. Add your comments below. Fantastic new architectural designs are unveiled daily, but will they stand? 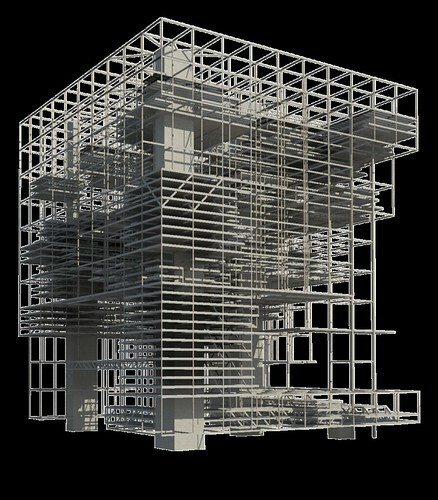 This site aims to explain the role of structural engineers and construction managers in bringing good design to life. We hope that by illustrating how structures can be made to stand, more creative, sustainable and livable designs will become reality.